When I was in junior high I received a chick for Easter as a result of a science project at school. A large incubator was filled with chicken and duck eggs which hatched just in time for Easter and the students in the class were given the chicks and ducklings. When I was given my chick I wrapped her up in a sweater and took her out to the car where my mom was waiting to pick me up. I said, “Hi, Mom. Guess what I’ve got!” Mom was gracious enough to allow me to keep the chick and we raised her and she became a backyard hen that gave us many tasty eggs over the years. She was one of the lucky ones. She lived a long and healthy life. 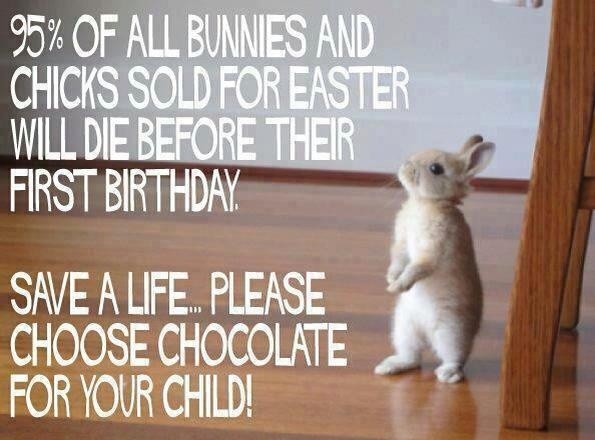 Unfortunately many bunnies, chicks and ducklings that are given as gifts at Easter either die before their first year or end up in an animal shelter. Animals are not disposable toys, they deserve more respect than that. Before giving a bunny, chick or duckling for Easter, please consider the welfare of the animal and whether the recipient can provide proper care for the animal long-term. My hope is that those who celebrate Easter will enjoy their Easter festivities but that they will also keep in mind the implications of giving an animal for Easter.